"I have an interview today. I will use this valuable info to it's fullest! I'm a natural closer, but ... your closing podcast [showed me] "what to do when it gets awkward." NOW I KNOW! THANKS! Already listened to some of these twice!" Need some job interview skills – fast? 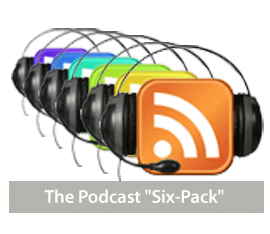 Whether you are in a hurry or just on the go, the Podcast SuperPack is your “go-to” solution. Targeted training for 6 different parts of the interview process is as easy as a couple of clicks of the mouse—or throw it onto your portable player and you’re out the door (and on your way to a job offer). Telephone Interview Prep – 10 minutes of “need-to-know” tips for accomplishing your main goal, getting to the face-to-face. Phone interviews have some unique advantages and challenges, and you’ll hear how to conquer them all. Brag Books – These are “something special” for your interview that reinforce your past accomplishments though evidence and examples. This podcast tells you what you MUST include, what’s not important, and how to skillfully use it to impress the hiring manager in the interview. Also 10 minutes. References – If they’re asking about references, you’re almost hired! Unlock the offer with these keys to not just choosing the best references, but prepping them so that they say exactly the right thing to get you to your goal. Use the bonus follow up tips to maintain a great relationship with your references. Behavioral Interviews – More than 12 minutes of powerful tips for preparing for and participating in behavioral interviews. Learn how to structure your answers for maximum impact; find out key questions to ask that uncover the hiring manager’s true needs and wants; and get a complete picture of how to weave your answers, brag book, and references into a compelling reason to hire you. Panel Interviews – Transform the most stressful of all interview styles into a relaxed and pleasant experience—no kidding! Use the 10 minutes of techniques you’ll learn here to keep your cool and make a great impression on each and every panel member. Closing for the Job – Your job interview is a sales process in which you are the product. When you learn to “close the sale,” you’ll significantly increase your chances of getting the offer. Get comfortable with the technique when you learn what questions nudge the manager into hiring you and how to overcome doubts that will keep them from offering you the job. Take advantage of this podcast format and even listen to them on the way to your next job interview. Arrive feeling cool, confident, and in control—and have a great meeting.